As a golf course architect, I hope to offer a different perspective on the game of golf than one may typically read in conventional golf publications. Many books have been written on golf course architecture. Rather than delve into a deep discussion about placement of hazards, green contouring, engineering theories on green construction, drainage, siltation control, etc., etc., I thought that I would present a broad overview of the various aspects of golf course design. Golf course architecture is a combination of art, craftsmanship and engineering that melds form with function. A good golf course should be enjoyable, memorable and challenging. 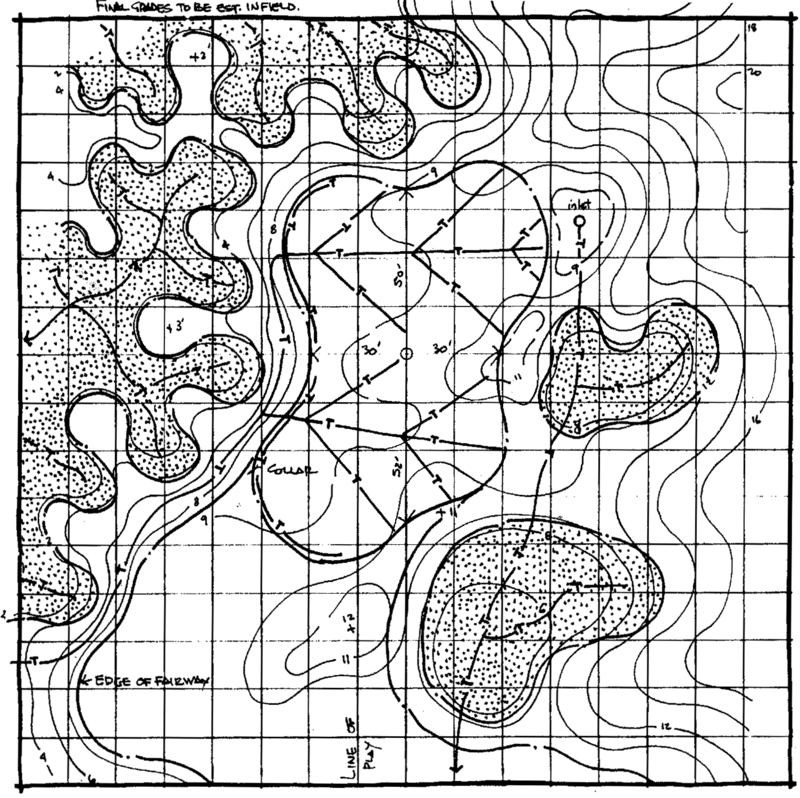 The first element in designing a golf course is site selection and evaluation. The most desirable site is gently rolling with reasonably draining soils and a location that is suitable for construction of an irrigation lake. Typically, 140 acres to 200 acres are required for an eighteen hole “championship” golf course. The topography is examined for existing site characteristics such as slope, soils, creeks, lakes and vegetation. The evaluation identifies items, such as potential wetlands, wildlife corridors, floodplains and easements that may require permitting. An available supply of water is necessary for irrigation. During drought conditions, an irrigation system may use 400,000 to 600,000 gallons of water per night. The golf course routing is the most critical element of designing a golf course. The goal is to take what nature has created and discover the best eighteen holes that exist on a particular piece of property. The course’s routing should provide a variety of hole lengths in differing directions, shot values and par sequence. The routing should incorporate natural site features such as wetlands into the golf course design. During the site analysis, usually several excellent golf holes and green locations will be obvious to the architect. These features are used as benchmarks for the routing study. From there a series of holes comprising the front nine and the back nine will be developed. Several routing studies and cost estimates are made analyzing all options for golf hole locations as well as clubhouse sites. After the golf course routing has been established, the strategic components are designed. I believe that the best design of a golf course is strategic rather than penal. In other words, the golf course strategy should create risk and reward characteristics by use of hazards and contours in the design that will encourage the better player to gamble for the opportunity of an improved shot, yet provide a safer, alternate route for the average player. The architect’s visualization of the golf course is reflected in grading and drainage plan. Final elevations, shapes, slopes and contours of all mounding, bunkers, tees, greens, fairways and drainage features are established. The proposed grading must take into account the construction and maintenance budget of the golf course. All existing and proposed drainage patterns are analyzed and the golf course drainage system is designed. The green complexes (the putting surface and its corresponding approach, bunkers, grassy hollows and mounding) are designed in detail. Each green should require a different approach shot and should have its own design, character and contour. Gentle contours on the putting surface provides surface drainage, interest and challenge. With golf courses in the Midwest getting 30,000 to 40,000 rounds played each year, it is obvious that a putting green endures a tremendous amount of foot traffic. The United States Golf Association’s specifications have proven to be a time tested, successful methodology for construction of putting greens. Irrigation systems are becoming more sophisticated all of the time. Computer systems control operation of the sprinkler heads as well as manage the flow throughout the system to more efficiently utilize water resources and power. Irrigation systems are designed to provide adequate coverage at particular precipitation rates for various types of grasses and soils. Choosing grasses for the golf course depends upon the climatic region in which the course is located. Fertilization schedules and grass selections for all golf course components are prepared and specified for the preplant. Recently many new varieties of bentgrass for putting greens have been introduced that thrive under difficult weather conditions. Incorporation of “native grasses” to provide a variety of textures and height into non maintained areas is desirable. Successful grassing is greatly dependent upon the time of seeding. In the Midwest optimal seeding times are typically from August 15 to September 15. The golf course architect prepares a complete set of plans, details and specifications for all aspects of the golf course construction. Instruction for bidders, materials and methods for each construction operation and contractual documentation should be spelled out in great detail so bids will be accurate and the work will be well defined. The greatest design in the world, on paper, is worthless unless it is properly constructed. The shaper is the ingredient the golf course architect needs to have his vision actually take form on the ground. The shaper is an artist that runs a bulldozer. He is the one that truly melds form with function. He can take the plans along with on site instructions to create the land forms that will become the golf course. A well designed golf course will always challenge a player to learn how to play shots that are confronted during a round of golf that he is currently not able to execute. A great round of golf should require an effective strategy and execution on the part of the player, while enjoying the natural surroundings. Golf Architecture in America: Its Strategy and Construction, George Thomas, Jr.